Adam Patrick DeVine (born November 7, 1983) is an American actor, comedian, screenwriter, producer, and singer. He is one of the stars and co-creators of the Comedy Central series Workaholics, as well as Adam DeVine's House Party. He plays the role of Bumper in the musical films Pitch Perfect and Pitch Perfect 2 and Andy in the sitcom Modern Family. His other roles include Neighbors, The Intern, The Final Girls, Mike and Dave Need Wedding Dates, Game Over, Man! and When We First Met. He has voiced characters in films including Ice Age: Collision Course and The Lego Batman Movie. DeVine has voiced characters on animated series Uncle Grandpa, Penn Zero: Part-Time Hero, and Vampirina. DeVine was born in Waterloo, Iowa, on November 7, 1983, the son of Dennis and Penny DeVine. In 2002, he graduated from Millard South High School in Omaha, Nebraska, where he was raised. DeVine attended Orange Coast College, along with friend and future co-star Blake Anderson. He later moved to Los Angeles, where he began working as a stand-up comedian and actor. In June 1995, when he was 11 years old, DeVine was walking his bike across a street in Omaha. After he waited for three cement trucks to pass, a fourth truck, previously blocked by opposing traffic, struck him. He went under the first two wheels of the 42-ton truck and slid 500 feet. He was knocked unconscious, suffered acute shock, and fell into a coma. He was rushed to intensive care, where he woke up two weeks later. He broke all the bones in both of his legs, had a collapsed lung, developed multiple infections, and it was unknown whether he would ever walk again. Over several years, he had 26 surgeries and spent much of the time using a wheelchair. Due to the extent of his injuries, DeVine was at very high risk of having to have his legs amputated, and having multiple organ failure. It was later discovered that the reason he was not killed was because his bike took the full force of the truck. DeVine regained full mobility but still has extensive scarring on his legs. He said of the accident, "It was really tough because I had to relearn how to walk, stand up, sit up and everything. The legs were totally mangled. I think that experience helped me realize that anything is possible." To pass the time, he would call into his local radio station and impersonate celebrities to entertain himself and others. Upon returning to school, he experienced bullying, but told jokes as a way to deflect attention away from his injuries. He later said that all of this contributed to how he saw comedy as a way of bringing people together. In 2006, DeVine and friends Blake Anderson, Anders Holm, and Kyle Newacheck formed the sketch-comedy group Mail Order Comedy. Although they toured together live, the group found greater success on websites such as Myspace and YouTube. The G4 series Attack of the Show! featured "Wizards Never Die", a music video by Mail Order Comedy (as The Wizards), in April 2008. Purple Magic, a music album by The Wizards containing 14 tracks, was released on April 1, 2009. Comedy Central's original series Workaholics premiered on April 6, 2011, and stars DeVine, Anderson, and Holm and co-stars Newacheck, all of whom also serve as series creators and executive producers. DeVine had small roles in Mama's Boy (2007) and National Lampoon's 301: The Legend of Awesomest Maximus (2009). He had a recurring role on the television series Samantha Who?. He also appeared on an episode of the Fox show Traffic Light (2011). In season 4 of Community (2013), he played a small role as William Winger, Jr., Jeff's half-brother. In the first episode of Arrested Development's fourth season, he played an airport ticket attendant alongside his Workaholics co-stars. He co-starred as Bumper Allen in the 2012 musical comedy film Pitch Perfect. For this performance, he won a Teen Choice Award for Choice Movie Villain and earned one nomination for Choice Movie Breakout. He reprised the role of Bumper in the film's sequel Pitch Perfect 2 (2015). DeVine has appeared in the SimCity video game trailers as The Mayor. DeVine is the voice artist for the character Pizza Steve in the Cartoon Network animated series Uncle Grandpa, which premiered on September 2, 2013. He stars in his own Comedy Central series, Adam DeVine's House Party, which debuted in October 2013. He also appears in a recurring role in seasons 5, 6 and 7 of the ABC network sitcom Modern Family as Andy, the Pritchett family's nanny. In 2016, he starred alongside Zac Efron, playing brothers, in the comedy film Mike and Dave Need Wedding Dates. DeVine also made a cameo appearance in the video for the 2016 Blink-182 song "She's Out of Her Mind". In 2018, DeVine played the lead, Noah Ashby, in the romantic comedy When We First Met, which he also co-wrote. His co-stars include Alexandra Daddario, Shelley Hennig and Robbie Amell. Also that year, Devine, Anderson, and Holm starred in the film Game Over, Man!, with Newacheck directing and Newacheck and Seth Rogen among its producers. On November 2, 2016, DeVine was cast as the lead of Walt Disney Pictures family-film Magic Camp, alongside Jeffrey Tambor and Gillian Jacobs. DeVine plays Andy Tuckerman, a failed magician who goes back to the camp of his youth to mentor a rag-tag bunch of magicians. Principal photography began in December, 2016 around Los Angeles. The film is scheduled for release April 6, 2019. In 2019, DeVine starred alongside Rebel Wilson and Liam Hemsworth in the romantic comedy/parody Isn't It Romantic. The film marked the fourth time that DeVine and Wilson have played love interests, after Workaholics, Pitch Perfect and Pitch Perfect 2. DeVine is a supporter of Children's Miracle Network Hospitals, a not-for-profit organization that raises funds for children's hospitals across the U.S. As he was treated by a children's hospital as a child, he attends charity events and visits the children, with his story of survival providing comfort to the patients and their parents. DeVine regularly takes part in USO tours, providing entertainment for military personnel across the world, and describes it as "the most rewarding experience of [his] life". After meeting on the set of The Final Girls in 2014, DeVine began dating Chloe Bridges in February 2015. 2007 Nick Cannon Presents: Short Circuitz Teen Episode: "1.1"
2007 The Minor Accomplishments of Jackie Woodman Toby Episode: "Dykes Like Us"
2008 Special Delivery Himself Episode: "Strike a Pose"
2009 Better Off Ted Josh Episode: "Win Some, Dose Some"
2011 Traffic Light Tobey Episode: "Stealth Bomber"
2012 Tron: Uprising Galt (voice) Episode: "Identity"
2013 Community Willy Jr. Episode: "Cooperative Escapism in Familial Relations"
2013 Arrested Development Starsky Episode: "Flight of the Phoenix"
2013 Comedy Bang! Bang! Nick Episode: "Sarah Silverman Wears a Black Dress with a White Collar"
2013 Super Fun Night Jason Episode: "Pilot"
2014 Sanjay and Craig Raska Boosh (voice) Episode: "Kerplunk'd!" 2014 American Dad! Christoff (voice) Episode: "Honey, I'm Homeland"
2015 Hell's Kitchen Himself Episode: "17 Chefs Compete"
2015 Steven Universe Pizza Steve (voice) Episode: "Say Uncle"
2015 Sin City Saints Matty Episode: "You Booze, You Lose"
2015 Drunk History Pavel Belyayev Episode: "Space"
2018 Vampirina Poltergeist Pat (voice) Episode: "Home Scream Home"
^ a b c Fishbach, Bob (August 9, 2013). "Adam DeVine, Omaha native, scores recurring role in 'Modern Family'". Omaha World-Herald. Archived from the original on October 16, 2013. Retrieved May 26, 2015. ^ Thorp, Charles (March 4, 2014). "Q&A: The 'Workaholic' Life of Adam DeVine". Rolling Stone. Retrieved May 15, 2015. ^ Zemler, Emily. "Adam Devine on Singing in Public, Gangster-Rapping Wizards, and Romantic Gestures". Esquire. ^ Steffen, Amie (January 23, 2012). "Waterloo Native Becomes a 'Workaholic'". Waterloo Cedar Falls Courier. Retrieved September 5, 2015. ^ DeVine, Adam (November 7, 2013). "Tweet from DeVine's verified account regarding his birthday". Twitter. Retrieved May 12, 2014. ^ "Adam DeVine on YouTube". YouTube. Retrieved December 31, 2013. ^ "National Lampoon Lemmings Comedy Troupe!". National Lampoon. Archived from the original on December 20, 2011. Retrieved July 22, 2012. ^ a b "Bios". Mail Order Comedy. April 6, 2011. Retrieved July 22, 2012. ^ a b "Adam Devine visits UNL to promote new movie". ^ "Adam DeVine Biography". TV Guide. Archived from the original on January 15, 2013. ^ "Adam Devine's origin story". EW. ^ "Purple Magic [Explicit]". Amazon.com. ASIN B003ESSTAS. ^ Seidman, Robert (August 11, 2013). "'Teen Choice 2013' Winners Announced". TV by the Numbers. Zap2it. Archived from the original on September 15, 2013. Retrieved September 30, 2013. ^ Kondolojy, Amanda (July 1, 2013). "Second Wave of Nominations Heat Up 'Teen Choice 2013'". TV by the Numbers. Zap2it. Archived from the original on October 16, 2013. Retrieved September 30, 2013. ^ Marechal, AJ (April 11, 2013). "Comedy Central Plans 'House Party' with Adam DeVine". Variety. Retrieved September 29, 2013. ^ Holpuch, Amanda. "Adam DeVine's advice for young people: 'Don't go to college, follow your dreams'". The Guardian. Retrieved May 15, 2015. ^ Kit, Borys (February 24, 2015). "Adam DeVine Joins Zac Efron For New Comedy". The Hollywood Reporter. ^ Pedersen, Erik (May 6, 2016). "Adam Devine & Alexandra Daddario Will Reminisce About 'When We First Met'". Deadline. Retrieved July 20, 2016. ^ "Workaholics Creators, Seth Rogen Team for Action Comedy 'Game Over, Man!". The Hollywood Reporter. June 6, 2016. ^ Kroll, Justin (November 2, 2016). "Adam DeVine and Jeffrey Tambor to Star in Disney's 'Magic Camp'". Variety. Retrieved November 3, 2016. ^ Evry, Max (January 10, 2017). "Magic Camp Begins Production with Jeffrey Tambor". ComingSoon.net. Retrieved January 11, 2017. ^ Kit, Borys (May 10, 2017). "Adam Devine, Liam Hemsworth Join Rebel Wilson in 'Isn't It Romantic' (Exclusive)". The Hollywood Reporter. Retrieved July 11, 2017. ^ "Adam Devine on Instagram". Instagram. November 29, 2017. Retrieved August 23, 2018. ^ Wasikowski, Jake (January 4, 2018). "Omaha native Adam Devine, dad recap USO Holiday Tour". 3NewsNow. Retrieved August 23, 2018. ^ Stephanie Webber (18 February 2015). "Adam DeVine Dating Pretty Little Liars' Chloe Bridges!". usmagazine.com. 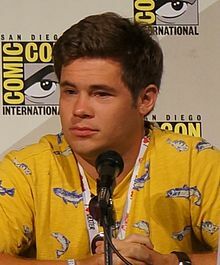 Wikimedia Commons has media related to Adam DeVine.